British Meat Pie Week continues with Trader Joe’s delicious (and heart-clogging) Chicken Balti Pies. If you read the previous post on Trader Joe’s Steak and Ale Pies, you know more or less what to expect here – it’s the same flaky, buttery crust, only this time they’ve pumped it full of a savory, mildly spicy, chicken curry. The result is just as warm and hearty as the Steak and Ale pie, even more delicious, and even more chock-full of fat. What it is: A hearty, British style pot-pie – with curry! 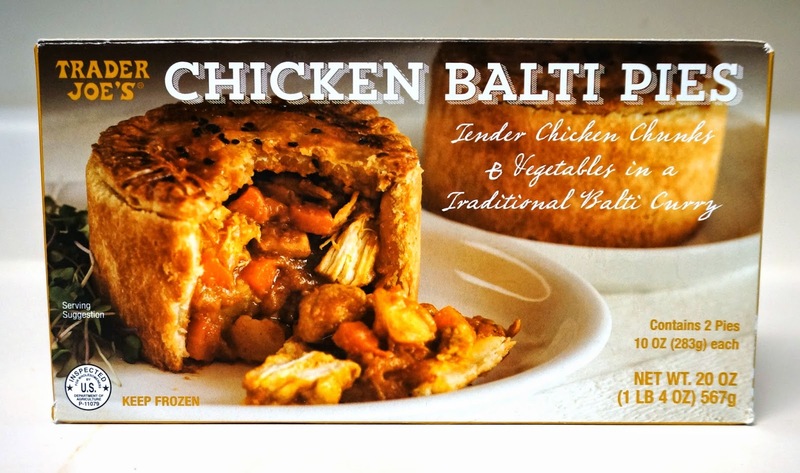 Rather than the ale-based steak stew in Trader Joe’s other British, meat-filled pastry Trader Joe’s has elected to fill this version with a particular form of tangy chicken curry known as “balti” (named after the the pot it was originally prepared in). Though still rich with chicken, potatoes and carrots, it’s notably less thick than TJ Steak and Ale variation. This is actually a good idea, as it lets the curry sauce speak for itself – and the curry sauce is pretty dang delicious. The mildly spicy and richly flavored curry sauce hits all the right notes – with a nice tang and just a little bit of fire. It’s good enough that I wish I could buy it just by itself – maybe in one of Trader Joe’s pre-made Indian Fare meals, like with their Punjab eggplant. Of course, in this case the balti curry is already sealed within the same singularly tasty pastry crust used by the Steak and Ale Pie. This shares the same strengths of the Steak and Ale variety (crispy, light, flaky, etc) and the same weaknesses (made with whole sticks of butter). Those calories from fat are still the big consideration here. The balti pies pack even more butter into the crust, if that were even possible, with 380 calories from fat, or 42 grams of fat per pie. Like the Steak and Ale Pie before it, these Balti pies have a strong tradition in England where they are consumed by “football clubs” (whatever those are…) with a nearly ritualistic fervor. If you share the belief, as so many do, that British food is unpalatable, picking up either these or the Steak and Ale Pies might just be enough to make you forget about all the bubble-and-squeak, eel pies, mashed peas, Branston pickle, various blood-based puddings, and so forth. Just don’t think too hard about your diet while you’re eating them. Would I Recommend It: Yes – better than pot-pie to be sure. Would I Buy It Again: As soon as I stop carrying about my waistline. Final Synopsis: Really good curry, in really good (really fatty) crust. Dying to get both these pies again. TJ says they are looking for a new distributor!? Who makes them? Is this yet another TJ product you get hooked on never to be seen again? Agree with your review 100%. These pies are, to say the least, VERY DELICIOUS; as well, the calories are, to say the least, disastrous. Very very good!! I was surprised, even better than the steak pie. They’ve changed the nutrition facts, slightly. Saturated fat is now 110% instead of 115%. Total calories are down to 710 from 740. Protein is down one gram to 22g. Sugars are down to 4g. So they’ve made it slightly more healthy.